In this post I will describe a quadcopter I recently built. A quadcopter is a multirotor aircraft where lift is generated by four rotors. Two rotors spin clockwise and the other two counterclockwise. The motors are connected to a flight controller, which continuously adjusts the speed of the motors individually through the electronic speed controllers (ESCs) based on input from (i) a remote control receiver and (ii) sensors located on the controller. This work is currently in progress. I am able to fly this build but I need to spend more time learning how to control it better, and tune and configure it further. It may still be necessary to change some of its components. The final weight of the quadcopter is about 1200 g (~2.6 lb) including the battery. The distance between the two adjacent motor centers is about 11". Disclaimer: This post contains affiliate links which means that if you buy products through clicking some of these links, I may earn an affiliate commission. Two clockwise and two counter-clockwise propellers are attached to four motors. Each motor is connected to an electronic speed controller (ESC). Each ESC is connected to (i) the flight controller, and (ii) the battery. The radio receiver is connected to the flight controller. All of this setup is mounted on a frame. I built the frame using 1/2" aluminum square tubes. I used 1/2x3” mending plates cut in half to connect the tubes. These mending plates are relatively light pieces, ~5 g as a whole and ~0.8 mm thickness, as opposed to thicker and heavier general purpose ones. I used 6-32 and 8-32 machine screws and nuts, and washers as necessary. I applied threadlocker to all screws and nuts to prevent loosening due to vibration. The landing gear is made from 1/2” CPVC tubes. In order to mount the CPVC tubes to the frame I used matching tube end-caps directly attached to the frame using a single screw each. In some cases, the tubes fell from the end-caps so I should probably put a layer of tape to keep them in place. I used 1/8” birch plywood for mounting the ESCs. I mounted the flight controller and the receiver on 1/8” acrylic sheet (red-colored sheet on the images). The flight controller (MultiWii 328P, which runs the open source MultiWii multirotor flight controller firmware) is attached to the acrylic plate by foam tape. I used cable ties to mount various pieces and tidy up the cables. The battery is held in place by Velcro strips attached to the plywood. The motors (NTM 28-30A 750kv, accessory pack) are mounted on the square tube directly using 6mm M3-0.5 machine screws. I only used the prop adapter from the accessory pack. I did not use the included cross-mount. I used 10X4.5” Slow Flyer Propellers (counter-clockwise, clockwise and counter-clockwise set) with the motors. The ESCs (Turnigy Multistar 30 Amp ESC) are connected to the battery (Turnigy 3S 20C 2200 mAH Li-Po) using a breakout cable. This specific breakout cable has six pairs of cables to support hexacopters. Two of the pairs are not used in this build. Also, I replaced the HXT connector with an XT-60 connector to accommodate the battery. 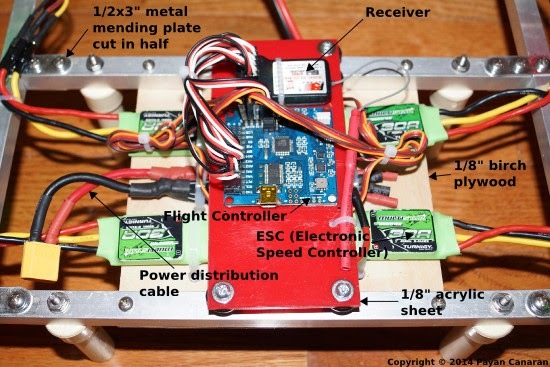 In this post I have not covered details of a number of subjects such as integrating the transmitter, connector layout on the flight controller and its software configuration and any details on cutting/drilling of the building materials. I may cover some of these areas in the future. Now I have the quadcopter flying, I would like to make it fly better. This will require more practice controlling it, configuring the controller software further and trying different components if necessary.